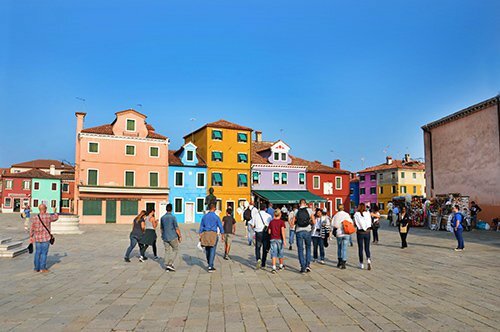 The Islands of Venice: Murano, Burano and Torcello: enjoy your tour with a private guide! 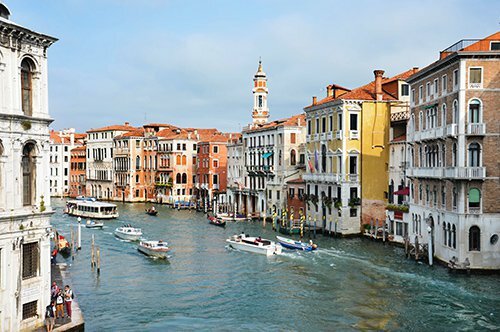 WHY VISIT THE ISLANDS OF VENICE: MURANO, BURANO AND TORCELLO? 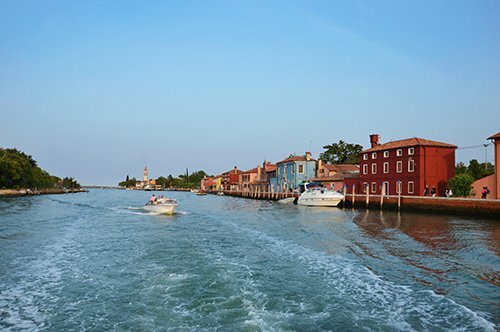 Visiting the islands of Venice, Murano, Burano and Torcello you can also visit the museums that arise from the characteristic activities of the islands. 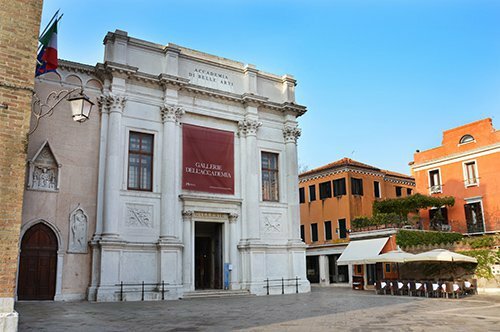 In Murano you can visit the Glass Museum, which is located in the historic Palazzo dei Vescovi di Torcello (Palace of the Bishops of Torcello), founded in 1861 by Abbot Zanetti. 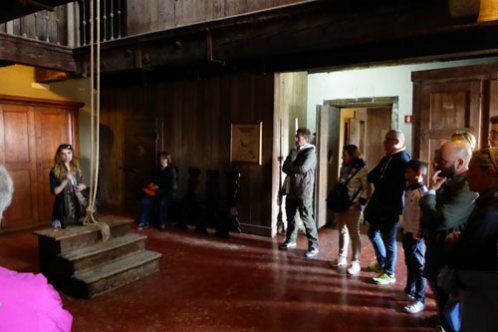 Inside the museum you will find Roman finds and a path that covers seven hundred years of history in the manufacture of glass in Murano, symbol of Venice around the world.  In Burano, on the other hand, it is possible to visit the Lace Museum, which occupies the headquarters of the Lace School, inaugurated in 1981 to revive the centennial tradition of lace making, which is still visible today. Currently it is possible to see lace teachers working inside the museum, transmitting their art to the next generation. 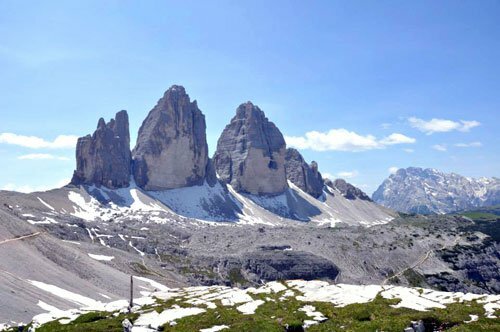 The lagoon of Venice originated almost 6000 years ago when the entrance to the sea allowed to form a lagoon in a region that for a long time was very unstable. Only after the year 1000 the lagoon becomes geologically more stable and allows a greater human settlement. The archaeological findings show that in Roman times the lagoon was occupied by small settlements and during the Middle Ages the population of the lagoon grew because many Romans took refuge there, escaping the barbarian invasions; the population grew even more with the arrival of the Longobards, during a period in which probably the largest centers such as Murano and Burano were born. WHAT ARE THE ISLANDS OF VENICE: MURANO, BURANO AND TORCELLO NOWADAYS? Currently the Islands of Venice are easily accessible with the ferries offered by the Venetian transport. The most characteristic of the islands is perhaps Burano, with its small colorful houses along the canals, said to have been colored with very bright tones to allow fishermen to recognize their houses easily even in the fog. Murano is famous especially for the production of blown glass and the typical "murrina", on this island it is possible to visit the Basilica of Santa Maria and San Donato, very particular for its mosaic floor. The island to the north is the island of Torcello, where currently a very small number of people inhabit it. The island has a landscape that immediately gives the feeling of antiquity as if time on the island had stopped at the time of the late Roman Empire. A peculiarity of this island is the bridge called "Ponte del Diavolo" (Devil’s Bridge) which is said to have been built by the devil in a single night to win a bet. Did you know that a legend tells that some men who lived on the island of Burano during the year 1000 found a floating stone box? The men tried to drag it to the shore, but the box was so heavy that not even all of them together succeeded in this mission; instead, four children were successful, it is said that this was possible thanks to their innocence and purity. Did you know that there is a legend that tells why in Torcello there is a bridge called "Ponte del Diavolo" (Devil’s Bridge)? Legend has it that a young Venetian girl fell in love with an army officer during the invasion of the Austrians. This love was not approved by her family who took her away from Venice. One day, however, the young woman received the news that her beloved had been murdered. Desperate, she abandoned all desire to live and to be saved she was advised to go see a witch. The witch signed a pact with the devil on behalf of the girl who could meet the young Austrian, but the witch was murdered before paying her debt to the devil. That is why it is said that every December 24 the devil returns to the bridge in the form of a black cat to collect his payment. After spending some time on the islands, you can discover and visit the most interesting monuments of Venice. 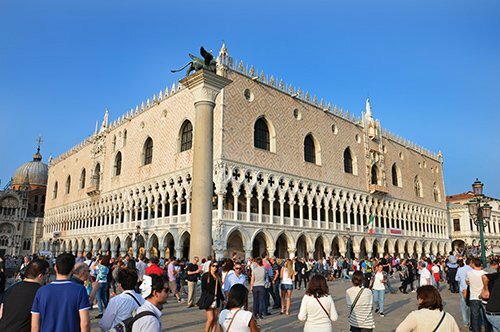 With the Map of Venice you can follow several itineraries and find, for example, the Museums linked to the Venice Museum Pass. 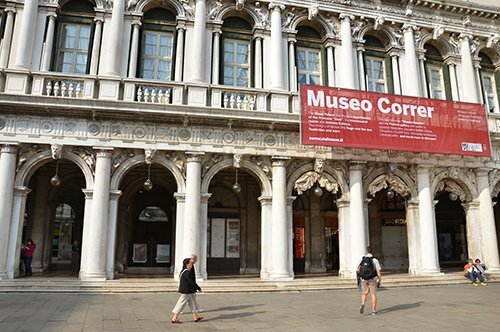 With this pass you will have access to the museums of St. Mark's Square and the Civic Museums of Venice with a unique entrance. The Museums of St. Mark's Square are the Doge’s Palace, seat of the Doge of Venice and seat of the political and administrative power of the city, where you can walk, in the company of an expert guide, through the Secret Itineraries of the Doge’s Palace; the Correr Museum, which follows the footsteps of the history and typical art of Venice; the Archaeological Museum houses a large collection of ancient Roman and Greek statues and the monumental rooms of the Marciana Library, where you will be fascinated by the splendor and collections of this ancient Library of Venice. 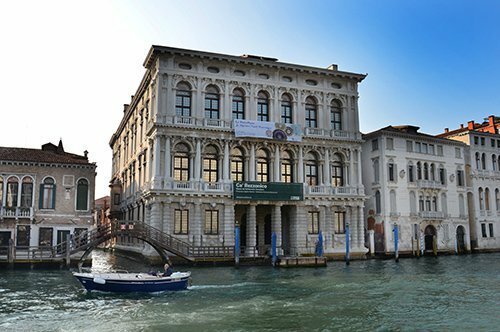 The Civic Museums, include the three islands of Venice, Murano, Burano and Torcello; the Mocenigo Palace with the Study Centre of the History of Textiles and Costumes; the House of Carlo Goldoni, a famous Venetian dramatist, the Ca' Pesaro, headquarters of the International Gallery of Modern Art and the Ca' Rezzonico, which exhibits 18th century Venetian paintings and sculptures. 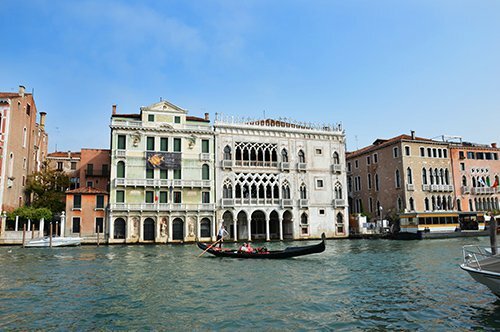 On your tour of Venice you can also admire other beautiful buildings such as the Ca' d' Oro with views of the Grand Canal or visit the Accademia Galleries of Venice. 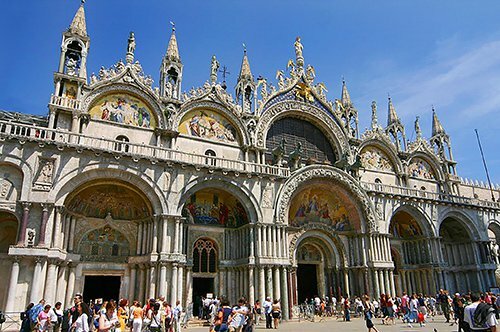 Definitely do not miss the visit to the most important church in Venice, the Basilica of San Marco that will fascinate you with its architecture and its interior decorated with golden mosaics and the Clock Tower that is always in St. Mark's Square. If you want to visit other Venetian churches, take into account the Basilica of the Saints Giovanni and Paolo, where most of the Doges of Venice were buried, or the church of Santa Maria Formosa.